bringing the arts to parts that they might not otherwise reach. Growing year on year since 2011, the 2016 festival was the most successful to date. More than 1400 people attended as audience and participants. Six hundred people stood in the school field in the dark of Saturday night and were mesmerised by the Inferno Fire Show. There were full houses and standing ovations for Sorcha Fox and Donal O’Kelly in the main theatre offering The Cambria. And capacity audiences for the Gap Children’s Cinema. A hundred children participated in painting and pottery making in the Drop-In Workshop. The pottery work has now been fired and the children have brought their art pieces home. and to The Atlantic Rhythm Section’s R n B. The ICA Community Tapestry – a wonderful work of women weavers depicting the hills and landmarks of the area was unveiled. Late on Saturday night local artist Ali Ali thrilled children and adults when he arrived in the field in a Flying Saucer. 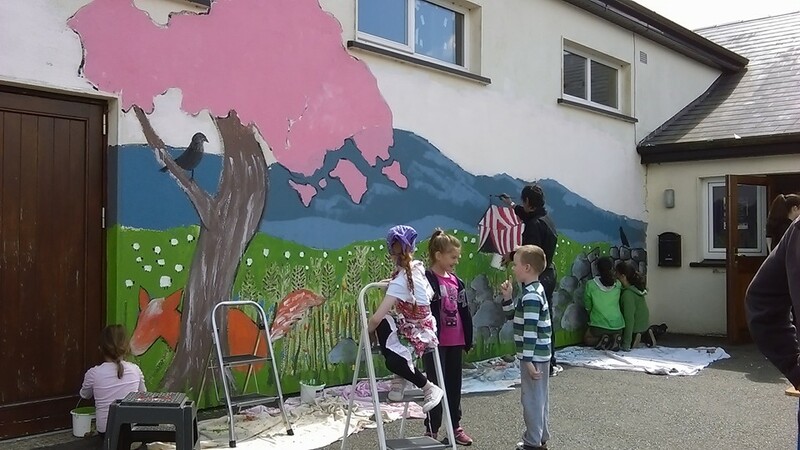 And on a sunny Sunday morning artist Dara McGee led groups of children (and their parents) in painting a mural on the wall of Ballythomas School. There were cups of tea and trays of popcorn. There was chat and laughter. Fields and sheep, flowers, stone walls, a fox and crows appeared. It was fun, it was playful, it was art. And it was on our doorstep. Many thanks to all our funders without whom it would not have been possible. The Arts Council, Wexford Arts Department, Gorey Town Council, Raheenleagh Windfarm Community Fund, and our local business and individual sponsors. And to you – our audiences! And check out and join up the Gap Film and Photography Group, – making and showing films and pics throughout the year.